Would you like to receive notification each time this page is updated? I live in Canberra ACT Australia. I also have an iPhone. I am currently retired. I am open to considering offers of short or long term paid or voluntary work, in Australia or overseas, which utilise my training, and experience. My training has been in the areas of accounting, economics, legal studies (BEc Monash), data processing (GradDipDP CIT), teaching (DipEd BEd Monash, Cert4TESOL Teach International), and educational administration and policy (MEd Melb). I have worked in the areas of adult training, information technology, teaching, research and planning, evaluation, and general public administration. I have contributed to a range of national and international conferences and journals on themes related to educational innovation, long range planning (more particularly, futures research), and technological change. More details on myself are included in my abbreviated curriculum vitae, which includes a link to my detailed list of publications, conference presentations, and related materials. This thesis was subsequently published by the ERIC Clearinghouse on Information Resources, Syracuse University, New York, USA (ERIC document reference: ED247936). ERIC documents are available from many major University libraries, throughout the world, and often also via the World Wide Web, as in this case. The Educational Resources Information Center (ERIC) site includes details on the ERIC service. I enjoy supporting organisations which have a particular focus on areas I am interested in, including such areas as education, free and/or inexpensive access to information, health, Information and Communications Technology (ICT), and the arts more generally. I am a contributor to Acronym Finder. I was elected a Fellow of the Australian Computer Society (FACS) in 1997. I was elected an Honorary Life Member (HLM) of the ACS in 2018. My name is included in the ACS virtual Hall of Fame. I am a Patron of the International Vegetarian Union (IVU). I am also a lifetime member of Vegan ACT. I am a life member of, and a silver donor to, Manning Clark House Inc. (MCH). I was an Inaugural Member of the National Gallery of Australia (NGA). I am a life Member of the National Gallery of Australian Foundation (NGAF). 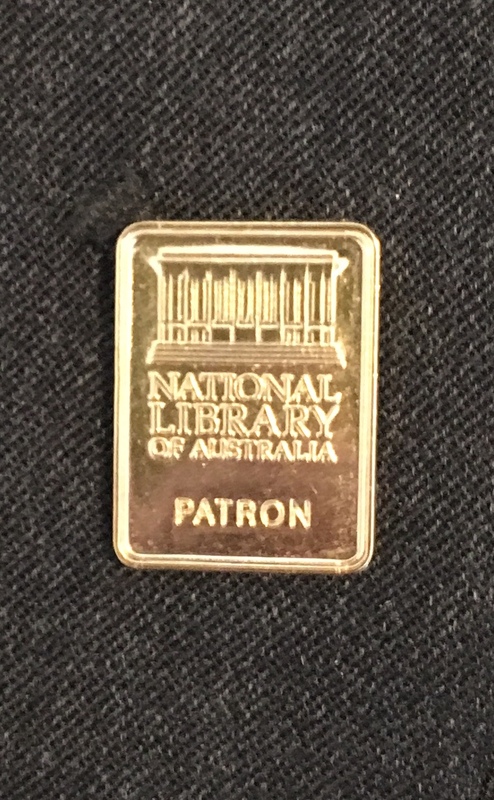 I am a Founding Patron of the National Library of Australia (NLA). My name is also listed on the Honour Board in the foyer of the NLA. which also includes contact details for more information on how to donate to, and become a Patron of, the NLA. as I find it can be a very good conversation starter about the benefits that result from giving to the NLA. I am a Patron of the National Museum of Australia (NMA). I am a Supporter of the National Portrait Gallery of Australia (NPGA). My name is also listed on the Honour Board in the foyer of the NPG. * Major Patron, of the National Trust of Australia - ACT (NTACT). I was a Patron of the Sydney Writers' Festivals (SWF) from 2014 to 2019 inclusive. I was a Supporter of the Chancellor's Cirle at the University of Melbourne during 2014. I found the Believe - The Campaign for The University of Melbourne video, to be one of the most inspirational presentations I have ever seen. I am also a member of the University of Melbourne Heritage Society. The opinions expressed on this Web page are purely personal, and do not necessarily reflect the views of any organisation I am a member, and/or supportive, of. I disclaim any and all liability for the accuracy and/or completeness of the information presented on this, and pointed to, Web pages. I will accept no responsibility for loss occasioned as a direct or indirect result of the use of information obtained thereby. I suggest you confirm the accuracy of the information provided, before using it for any purpose. times since 2 August 1996.